Get the inside story on the world's most incredible inventions that made history and transformed the way we live today. This fun-packed reference title for children charts the brilliant breakthroughs of great geniuses from ancient times through centuries of technological progress to today's modern era. 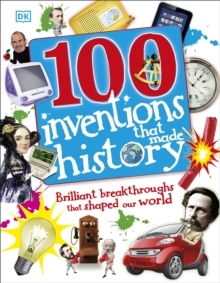 Part of the best-selling top 100 series, 100 Inventions That Made History comes full of inventions and ideas, from aeroplanes, batteries, and chocolate, to video games, wheels, and X-rays - and not forgetting the little gadgets and gizmos we couldn't live without! Each profile provides an in-depth exploration of an important invention, while the galleries present a selection of inventions on a shared theme, all aimed at the younger reader. 100 Inventions That Made History will open your eyes to a world of wonder, ensuring you never look at anything in the same way again. Be inspired with some ideas of your own and you may become an inventor of the future!